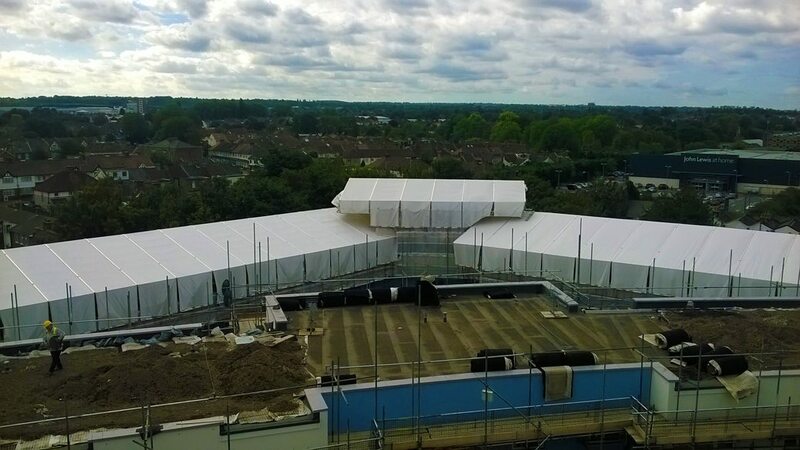 Generation UK Frimley, were asked by our client to help with a large-scale temporary roofing contract in Croydon. The initial scope of the job involved designing and supplying a temporary roof structure to cover 8 large curved blocks of flats. It was clear that the only roofing system that would be suited for this extraordinary job would be the Generation UNI Roof; due to the curved buildings, the project required a total of 20 roofs with most of them overlapping. To date, this is the largest consolidated roof project supplied in Europe on one site! The nature of this project demanded a safe, quick and easy temporary roof system that could be erected and dismantled with minimum impact to the residents living in the flats. Mark Lane branch manager of Generation south London said, “…that after numerous meetings with their Technical Manager and designers, it became apparent that the only system suited for such a large scale job would be the Generation UNI Roof System”. The Generation UNI Roof was chosen not only for the speed of erection and dismantling, but the client was also very keen to have a system that was aesthetically suited to this high profile job. The Technical Manager continued, “…with minimal and lightweight components the erection time far exceeded our expectations. We estimated that a temporary roof project of this magnitude constructed in traditional roof materials would have taken 90 days. We managed to complete the structures 30 days ahead of schedule”. Once again the Generation UNI Roof exceeds our client’s expectations; with its cost effectiveness, compatibility, versatility, safe and quick erection times, as well being aesthetically pleasing, again demonstrates why the Generation UNI Roof is the best solution in temporary roofing on the market. Interested in finding out more about the Generation UNI Roof? Contact our experts today!